With the WHL playoffs almost upon us, you can bet that those teams headed for the post-season are sweating bullets as they wait and wonder if they will hear from Mr. Mumps. Barzal, arguably the WHL’s best forward, took the warmup prior to a 3-2 victory over the visiting Everett Silvertips on Friday night, but then left for the dressing room and didn’t return. He was said to be experiencing flu-like symptoms. Barzal wasn’t in the lineup on Saturday as the Thunderbirds dumped the Winterhawks in Portland, 6-3. Barzal has 79 points, including a career-high 69 assists, in 41 games. He began the season with the New York Islanders, who selected him in the first round of the NHL’s 2015 draft. It seems feasible that any WHL coaches or players who don’t feel well from now through season’s end will be tested for mumps. The Royals isolated head coach Dave Lowry and one player prior to a 6-2 loss to the Blazers in Kamloops on Friday. It now seems that there are at least two players involved. The Victoria Times Colonist has reported that D Ralph Jarratt and D Mitchell Prowse both have experienced flu-like symptoms, have undergone testing for mumps, and have been isolated. The Royals, who next play Tuesday when they are to meet the Vancouver Giants in Langley, B.C., are awaiting test results on all three. The Giants lost 4-3 in Kamloops on Saturday. Vancouver chose not to use the new visitors’ dressing room, the same one that had been occupied by the Royals from Wednesday through Friday night. Instead, the Giants operated out of what had been the visitors’ room prior to this season. A new dressing room was built to facilitate the 2016 IIHF World Women’s Championship that was held in Kamloops a year ago. Prior to this weekend, it was believed the mumps outbreak had been contained in the Eastern Conferece with the Brandon Wheat Kings, Medicine Hat Tigers and Swift Current Broncos having had issues. The NHL’s Minnesota Wild and Vancouver Canucks also have had players diagnosed with the mumps in the past two or three weeks. With the WHL playoffs almost upon us, the Seattle Thunderbirds chose not to take any chances with G Rylan Toth on Saturday night. In a game against the Winterhawks in Portland, Toth stopped all 11 shots he faced in the opening period, but didn’t return for the second period. Originally, I reported that Toth left because of illness. That appears to have been in error. I have since been told that Toth has a “lower-body issue” and that his removal was simply a precaution. The Thunderbirds will be careful with this because he’s their horse and they need him if they are to make a deep run into the spring. Toth leads the WHL in victories — he is 36-18-3 — and is fifth in GAA (2.75) and has a .902 save percentage. . . . On Saturday, G Matt Berlin played the last two periods for Seattle, as the Thunderbirds skated to a 6-3 victory. . . . Seattle, which leads the U.S. Division by one point over the Everett Silvertips, next is scheduled to play Wednesday in Spokane against the Chiefs. 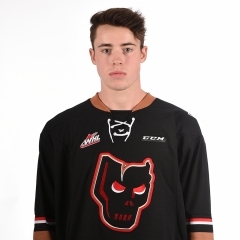 D Nolan Orzeck, a Calgarian, has signed with the WHL’s Kootenay Ice. A fourth-round selection in the WHL’s 2016 bantam draft, Orzeck announced via Twitter that he had signed. Orzeck, who turned 16 on Feb. 20, played this season with the midget AAA Calgary Northstars, putting up five goals and six assists in 30 games. F Alex DeBrincat of the OHL’s Erie Otters had his 19-game goal-scoring streak end on Sunday in a 7-0 victory over the host Peterborough Petes. DeBrincat does hold a share of the OHL record for consecutive games with a goal. That record had been held by F Mike Ricci, who did it with the Petes in 1988-89. . . . DeBrincat, who is still riding a 24-game point streak, has 62 goals and 60 assists in 60 games. He leads the OHL scoring race by 18 points over line mate Taylor Raddysh. A game in the Norwegian League playoffs on Sunday was decided in the eighth overtime period when Joakim Jensen scored to give the host Storhamar Dragons a 2-1 victory over the Sparta Warriors. . . . The Dragons lead the best-of-seven quarterfinal series, 3-2. . . . The game, which lasted 217 minutes 14 seconds, ended at 2:32 a.m. . . . The longest game in WHL history lasted 136 minutes 56 seconds, with the Kootenay Ice beating the visiting Kamloops Blazers, 3-2, on March 25, 2003. F Colin Sinclair scored the winner in the fourth OT period. It was Game 3 of a first-round playoff series. The longest game in NHL history was played on March 24, 1936. It ended at 16:30 of the sixth OT as F Mud Bruneteau scored to give the Detroit Red Wings a 1-0 victory over the Montreal Maroons in Game 1 of a 1936 Stanley Cup first-round game. It's embarrassing to see parents yelling at Refs and kids at a Midget AA game. I told a guy to zip it and people cheered. Just Stop already! Jason Stephens is the general manager and head coach of the junior B Golden Rockets, who play in the Kootenay International Junior Hockey League. conference’s second wild-card spot, three points ahead of the Saskatoon Blades. Calgary is fourth in the Central Division, two points behind the Red Deer Rebels, who hold a game in hand going into the final week of the regular season. . . . Red Deer is to visit the Medicine Hat Tigers on Tuesday, then return home to meet the Hitmen on Wednesday. . . . The Blades will face the Pats in Regina on Tuesday. . . . F Trey Fix-Wolansky (23) gave the Oil Kings the lead at 14:40 of the first period. . . . Calgary F Tyler Mrkonjic (7) tied it at 18:23. . . . F Lucas Cullen’s fourth goal gave the Hitmen the lead at 16:31 of the second period, but Edmonton tied it 18 seconds later when F Jesse Roach scored his second goal. . . . Calgary put it away with the next three goals. F Matt Dorsey started it with his second goal, at 18:53 of the second period. . . . F Matteo Gennaro added insurance with No. 42 at 16:26, then F Beck Malenstyn (28) added the empty-netter at 19:20. . . . Calgary got two assists from F Jakob Stukel, with Dorsey adding one. . . . Dorsey, a 17-year-old from Wenatchee, Wash., who was a third-round pick in the WHL’s 2014 bantam draft. He has two goals and three assists in five games this season, after missing the past two seasons thanks to knee problems. . . . The Hitmen got 29 saves from G Cody Porter. . . . G Patrick Dea turned aside 32 shots for the Oil Kings. . . . Edmonton was 1-3 on the PP; Calgary was 0-2. . . . The Oil Kings (20-43-6) have lost 12 in a row (0-10-2). . . . Announced attendance: 10,143.
the Everett Silvertips, 4-3. . . . F Cody Glass scored his 32nd goal and added two assists in the late flurry. . . . D Caleb Jones (9) scored while shorthanded at 14:21 of the third period to get Portland to within a goal. . . . Glass tied the score at 17:23. . . . F Skyler McKenzie won it with his 41st goal, at 19:47. . . . F Keegan Iverson, Portland’s captain, drew an assist on each of the last two goals. . . . The Silvertips had gotten out of the first period with a 2-0 lead on goals from F Brandson Hein (3), at 2:20, and F Matt Fonteyne (17), at 15:58. . . . 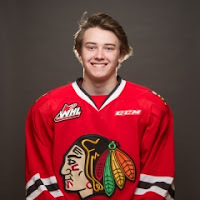 The Winterhawks cut into that lead when F Lane Gilliss got his fifth goal, at 11:49 of the second period. . . . Everett F Eetu Tuulola (17) got that one back just 18 seconds later. . . . G Cole Kehler stopped 32 shots for the Winterhawks. . . . Everett got 42 saves from G Carter Hart. . . . Portland was 0-2 on the PP; Everett was 0-5. . . . The Winterhawks (38-27-4) moved into third in the U.S. Division, one point ahead of the the Tri-City Americans, who have four games remaining. Portland has three games left. . . . Tri-City now holds down the Western Conference’s second wild-card spot, a point behind the Victoria Royals. . . . The Winterhawks and Americans are to meet Tuesday in Kennewick, Wash. . . . Everett (41-16-11) is second in the U.S. Division, one point behind the Seattle Thunderbirds. . . . Announced attendance: 9,176.